We’ve been spending a lot of time outdoors now that spring is here, well, that and it’s like 70 degrees every day (awesome). Ken has taken a liking to chasing birds around the yard, and we have taken a liking to watching Ken chase the birdies. He runs after them, yelling “hiiiii birdie!” with his arms out, like a mummy. We stopped at our local Ace Hardware for some other stuff, and they have a generous display of bird food to purchase by the pound. So we filled a bag with the most generic one they had (hey, so if you know anything about birds and bird food, please do tell). It cost us a whooping $1.50. 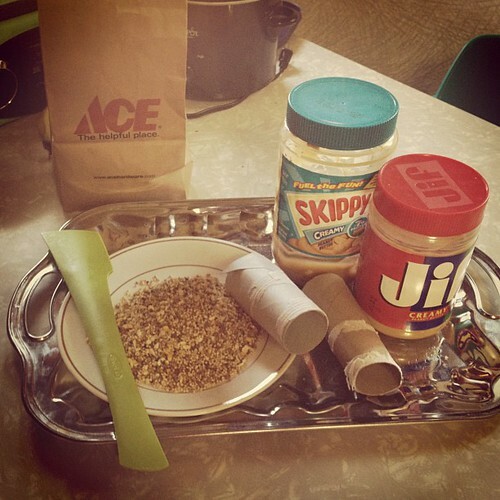 Spread the peanut butter on the tube, roll in bird seed. 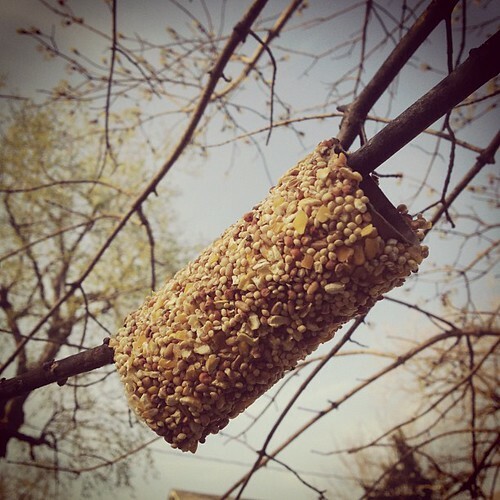 Hang in a tree for the birdies to enjoy. We shall see tonight if this milkshake brings the birds to the yard. I was really torn as to how I should dress. Should I just show up in clothes I wore in high school? Na, that doesn’t really scream anything other than “Ginny!” (which doesn’t work when attending a party with people you hardly know and see once a year). 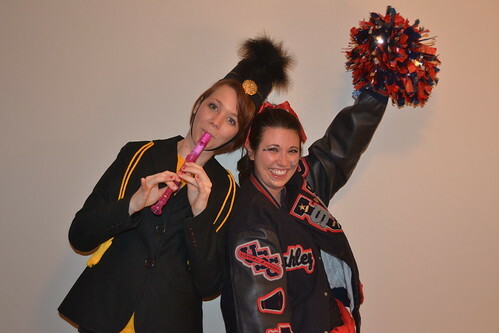 Cheerleader was out, that was Ashley’s thing. Football player, sure I’ve got the jerseys, but that’s not creative. 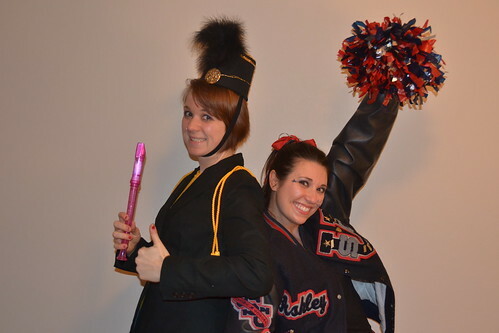 Finally, the night before I was leaving to go out of town, I decided on my costume: A Band Geek. Now, we aren’t spending $ this year. So my costume had to be stuff I already have, or stuff I could fasten out of stuff I already have. I had two inspirations. 1. Ken, who has taken a liking to wearing bowls and plastic containers as hats. 3. Fabric scraps, solid colors work great. I used t-shirt sleeves. 7. Feathers. Lots and lots of feathers. Next, trace around the bottom of the butter container. Cut yourself a piece of fabric to this size. Set it aside. If you’re using a knit fabric, cut a piece to use as a strap under your chin. Cut it so that it’s stretchy enough to get on and off – this isn’t an exact science. 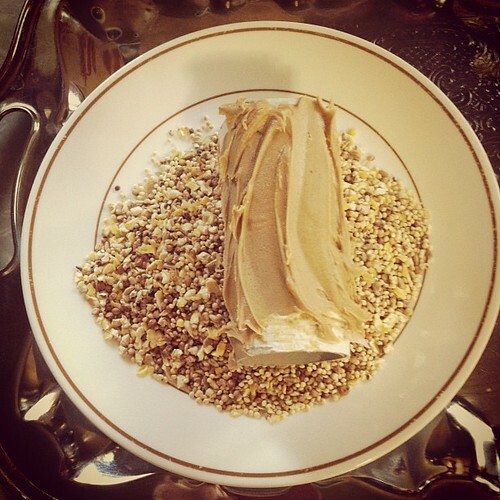 Cut a piece that is like 15 inches long also set it aside for later. Take a larger piece of fabric and wrap the container. I used a t-shirt sleeve, and it was large enough to just fit the size of the container with minimal extra. I folded the extra and glued it to itself. 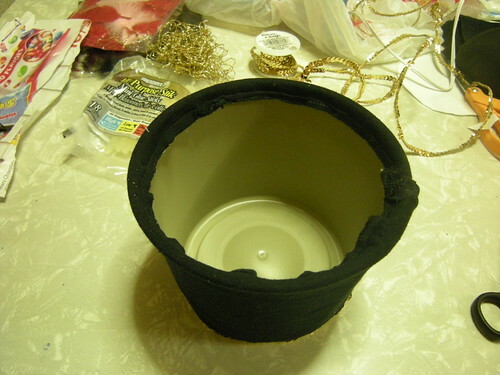 Fold excess fabric into the hat and have fun gluing. No one will see this part, so do what you need to do to get it to stick. Next, turn the hat over and glue down the top. I didn’t get an exact photo of this. Just fold and glue it down. Then, take your round piece of fabric, and glue it OVER the ugly part. I got excited and also glued on my embellishments, but you get the idea. See, no uglyness! 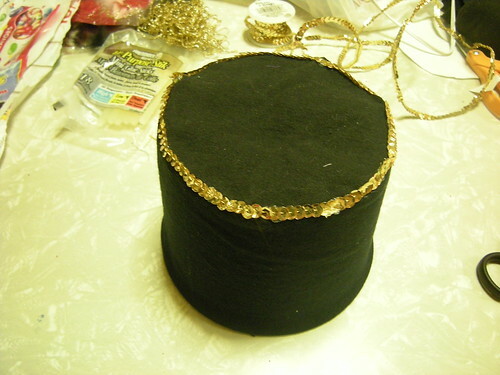 Now is also the time to glue on any other stringed embellishments you want around your hat. Do it now, before you glue the feathers on. So, there should be a seam on the side of your hat. We’re going to cover it with feathers. 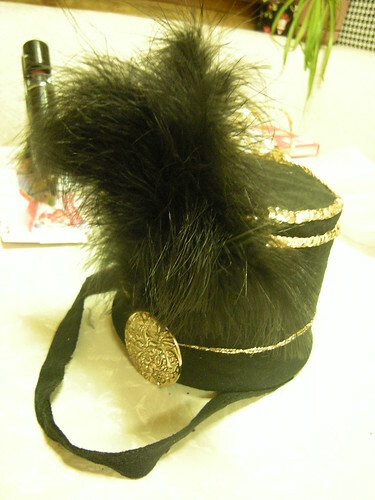 Starting at the top of the hat, glue your feathers on one by one, from the top of the hat, down to the middle. Be generous. You want your plume to shine. Once you get your feathers on, pin on your ugly brooch. I used this nice gold one. Pin it at the bottom of the feathers, to cover up the uglyness that comes along with hot glue and feathers. You know what I’m talking about. I’ve also glued on a neck strap. Just more t-shirt scraps. Once I had the hat all decorated, I glued on one end of the strap. 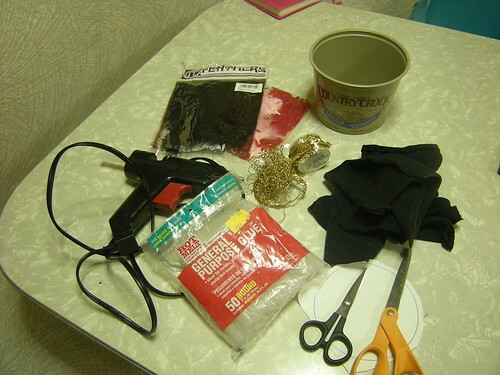 Once the glue was set, I held the hat on my head with one hand, and played around until I figured out where to glue the other side of the strap – the catch is being able to get the hat on and off WITH the strap glued on. It’s totally doable. Don’t make it too tight or too loose. The rest of my costume consisted of black pants and a blazer (Thanx Lindsay!!! ), a recorder, black socks and graduation tassels. I was going to wear white socks in spite of my old band director, but I decided to make him proud instead. 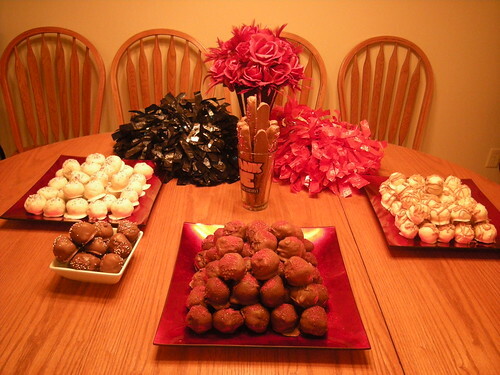 I also made cake balls for the party, which didn’t really fit the theme, but did fit my budget and cleaned out my freezer. That's a lot of balls! 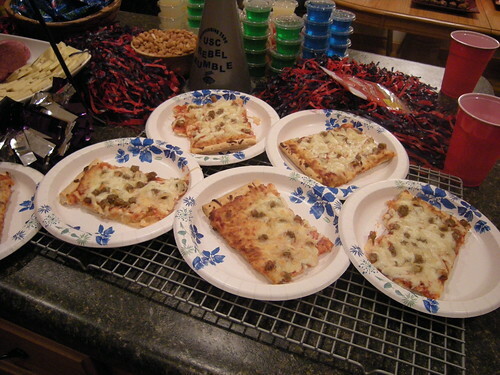 We also ate School Lunch Pizza and Jello shots. 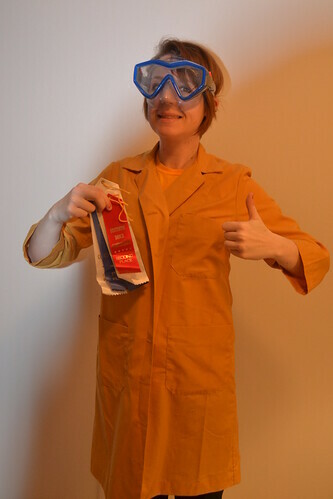 Let's go do science stuff!